Sudan has welcomed a toned-down version of a UN Security Council resolution on the crisis in Darfur. The new draft drops sanctions threats, saying instead "measures" would be taken if Sudan fails to disarm militias blamed for violence in Darfur. Sudan and its allies had curbed the original ruling's "extremity and aberration", Foreign Minister Mustafa Ismail told Akhbar Al-Youm newspaper. It is widely expected that the resolution will be passed on Friday. 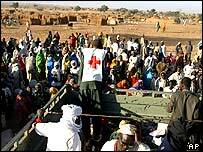 More than one million people have fled their homes in the western Darfur region and up to 50,000 have died. An estimated 2.2 million people are in urgent need of food or medical attention. A meeting of African leaders is also discussing Darfur. The summit in Ghana has broken away from scheduled talks on Ivory Coast at the instigation of Nigerian leader Olusegun Obasanjo, who wants to find an "African solution" to the crisis. He is urging African countries to send more troops to Sudan, than the 300 they have already promised, saying the situation has got worse than when the African Union discussed Sudan earlier this month. The first of the 300 troops are expected to arrive next week, reports AFP news agency. Analysts say 15-20,000 troops would be needed in Darfur, which is the size of France. "We expect an attenuated resolution to be issued by the Security Council today," Mr Ismail told Friday's issue of the independent Khartoum daily, Akhbar Al-Youm. Sudan had planned to either try to have the original resolution blocked or push for the removal from it of references to genocide, ethnic cleansing and "other extreme points", he said. Although the resolution no longer mentions the word "sanctions", the new text threatens action unless the Sudanese government reins in the Janjaweed within 30 days. US Secretary of State Colin Powell defended the new wording saying the word "measures" was "more acceptable to a broader number of members of the Security Council". The US has said hundreds of people are dying every day because of the Sudanese government's failure to act. Aid workers say sanctions are the only way to stop abuses in Darfur. An aid agency spokesman - who wished to remain anonymous - said the changed US resolution appeared set "to let the government off the hook". Sudan denies backing the Janjaweed.